Interviews with Status & Parade! Hey everyone, Jamie here! Today we have 2 lovely interviews to share with you. Our girl recently talked to Status. Of course she spilled about The Hunger Games. 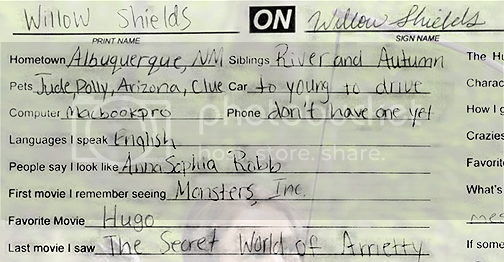 We’ve also learned that the coolest thing that Willow owns is a Go-Kart! Really cool, don’t you think?! We cannot inclue the whole interview, but check out a part of it below. Click here and scroll down a bit to read the full interview. I’m great! I was actually cleaning up a mess. I’m on a kick making my own natural bath stuff… salts, fizzies. I got salt and baking soda all over the kitchen. Clearly, you’re pretty young. How does it feel to be leading a very “non-average” (so to speak) life, especially at your age? Also, Willow talked to Parade on the future Hunger Games films, on being Team Katniss, her love for books and a lot more. We have added a section of the interview below, if you want to read the full interview click here. On getting the role of Prim. On the first day of filming. The Hunger Games premiere pictures & new scans! Hey everyone, I hope you had a great weekend. Today we have 4 pictures of Willow at the worldwide premiere of The Hunger Games, they just keep popping up! There are even 2 pictures of Willow signing autographs, she must’ve felt so proud! However, that’s not all we’ve got to share. Thanks to Katerina, we also have 2 scans of Willow in Girls Life Magazine! Go and check out the pictures in our gallery or by clicking on the thumbnails below. The Haunting Hour, interview & new pictures! Hey guys, I’m so excited about this update. We have lots of stuff to share with you today! First off, our girl booked a new role, how exciting! Congratulations, Willow! She is going to guest-star in an episode of the upcoming third season of The Hub’s spooky anthology series, R.L. Stine’s The Haunting Hour. Willow will be portraying a young girl named Eve, who has always felt like an outsider. That feeling becomes more intense after her younger brother is born. After meeting a woodland faerie who reveals her true lineage, Eve will have to decide whether she’ll sacrifice her brother for a new life and family. We cannot wait to see her episode! Now some news on The Hunger Games. Willow was recently interviewed by Celebuzz. She talks about her role and much more. Watch it below. In other news, we also have a few pictures to share with you. We have added 2 pictures of Willow attending the midnight premiere of The Hunger Games in her hometown! We’ve also got 2 new absolutely gorgeous photoshoot pictures. We just love them, so go and check them out below! We’re on a roll with updates today! First of all we found this question and answer Willow did for Myspace- here’s a little preview, check out the full thing in our gallery! Willow has also been busy doing interviews for a few sites and magazines- here are the links!